Outlook Mail for Windows 10 left a lot to be desired when it launched back in July. 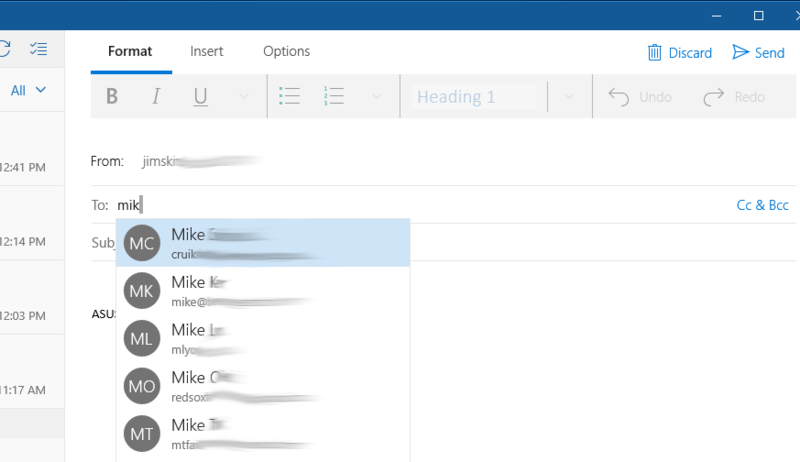 So much so that it forced me from using the Windows 10 Mail app to using Outlook Desktop on my office PC. I struggled through using Outlook Mail on my notebooks and tablets for the past six months, but I must say things have improved quite a bit. Definitely at a usable state now, although maybe not enjoyable. Outlook Mobile Mail was an equally frustrating experience while I was running beta versions on my Lumia 635 via Windows Insider. 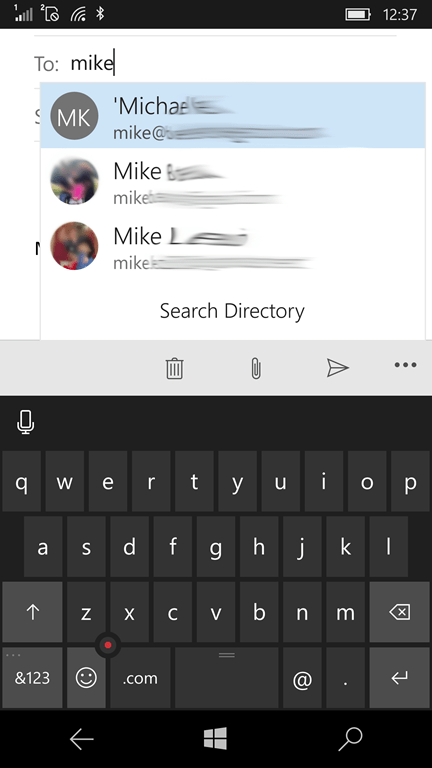 But when I got my Lumia 950 with Windows 10 Mobile installed, Outlook Mobile Mail worked pretty well. Not perfect mind you. Compared to Windows Phone 8.1, some things were better, some not so much. One thing I am pretty sure of though is when I started typing a recipients name in the “”To:” box, all the names starting with those letters would pop up. Well it looks like something changed in the past few weeks. Now, when I start or reply to an email on my 950, only names where the email address also starts with the same first few letters will popup. So Outlook Mobile Mail is filtering by “email address” only. Not first name, not last name. Email only. The same is NOT true for Outlook Mail for PC, which BTW is “supposed” to be a Universal app. Right. You can see in the top photo, I have two contacts named Mike who have email addresses that don’t start with “mik”. Trying the same thing from my phone, those two names are filtered out. If I start type the email address of my coworker Mike, which starts with “redsox” (he’s a big fan), his name pops right up. WTF! I tried People, Messaging and the Phone app on my 950, and they still filter by first name or number. No problems. No idea why or when this changed, but it’s disturbing that in 2016, I now have to remember all the email addresses of my 400 contacts (most of which have more than one address) in order to send an email. Come on Microsoft! How hard can this be. UPDATE: 2/10/16: I was pleasantly surprised this morning when I read that Outlook Mail had been updated, and upon testing discovered that the problem outlined above was “fixed”. That was fast. Now, it appears Outlook Mobile Mail filters by first & last name, same as the desktop version of Outlook (Modern) Mail. Not sure if adding, “filter by email address”, would be a good thing. But at least now I only need to remember a person’s or company’s name. Thanks Microsoft!